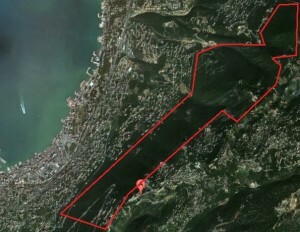 LBC television reported on Sunday that Saudi Prince Muqrin bin Abdul Aziz, who bought a plot of land in the town of Dlebta facing the Christian pilgrimage site of Our Lady of Lebanon in Harissa., decided to resell it to a Lebanese citizen after the town’s residents and a number of Christian MPs objected to the purchase. Prince Muqrin asked one of his Lebanese friends, head of the Hotel Owners Association Pierre Ashkar, to resolve the issue. Ashkar told LBC that the Saudi prince asked him to obtain an estimate on the land’s value and sell it to a Lebanese investor. Ashkar also said that he would preferably sell it to a Christian. Prince Muqrin bought four real estate properties totaling 7,700 square meters in Dlebta. The purchase took place following the approval of the cabinet and the publishing of the listed sale in the official gazette. Dlebta’s residents objected to the deal and filed a complaint with the relevant authorities.